a 2nd Lieutenant in the 18th Infantry. to January, 1872 when he returned to duty at Columbia. He took a leave of absence from June 2 to August 30, 1874. 18th Infantry who, as a Brevet Major-General was detailed as commander of the Department of the South. when he changed duty station to Fort Assinniboine, Montana. He was on detached service from October 10, 1881 to January 11, 1882 and was promoted to 1st Lieutenant on February 6, 1882.
to March, 1890. During most of the above years Wheeler was assigned to Company B, for certain, at least, from 1879 through 1890.
to the Mexican authorities. In 1892 Wheeler was given command of Company E.
near Jaro on March 1 and March 16, 1899. On September 8, 1899 he was promoted to Major of Infantry, 18th Infantry. at Fort Logan, Colorado until February, 1903. On February 4, 1903 Wheeler was promoted to Lieutenant Colonel of the 10th Infantry. sick leave to January 22, 1906. While on this extended sick leave, on October 11, 1905 he was promoted to Colonel of the 22nd Infantry. His case was before the retiring board and on February 17, 1906 he was retired with a disability in the line of duty. 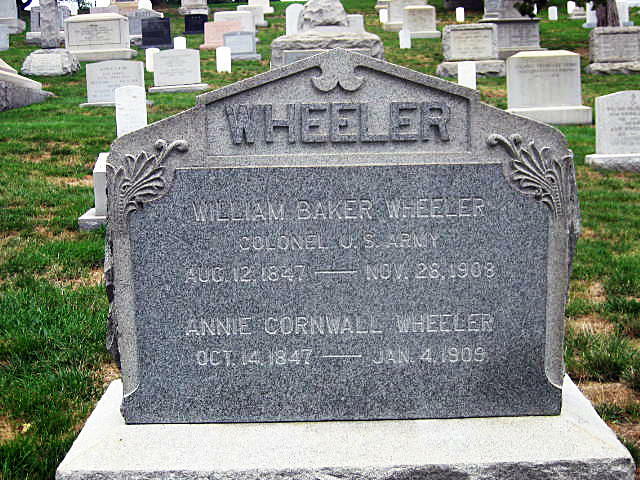 William B. Wheeler died November 28, 1908 at Gainesville, Florida at the age of 61. 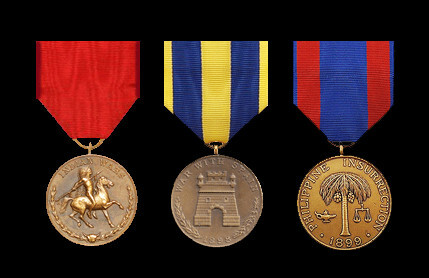 Commanding Officer 1-22 IN 1999-2001. WILLIAM BAKER WHEELER. No. 2400. CLASS OF 1871. Died November 28th, 1908, at Gainesville, Florida, aged 61. COLONEL WILLIAM BAKER WHEELER was born in Chaumont, New York, August 12th, 1847.
in the schools of that town. in the Army to Second Lieutenant Eighteenth Infantry. Served at Yorkville and Columbia, South Carolina until January 1877.
as to win the approval of that sterling soldier and upright man, Major General Ruger, who appointed him Aide-de-Camp. He also won the heart of Mrs. Annie Cornwall Smith, whom he married at Jacksonville, Florida, February 19th, 1878. May to November, 1879; Fort Assiniboine,Montana, to May, 1883. Fort Assiniboine, Montana; to May, 1885; Fort Hays, Kansas, to September, 1889; Fort Clark, Texas, to March, 1890. 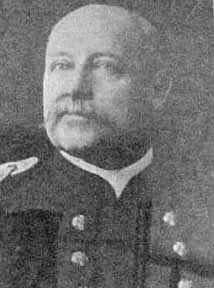 Promoted Captain Eighteenth Infantry February 20th, 1891, while in command of Camp San Felippe, Del Rio, Texas. Fort Sam Houston, Texas, until the outbreak of the Spanish-American War. 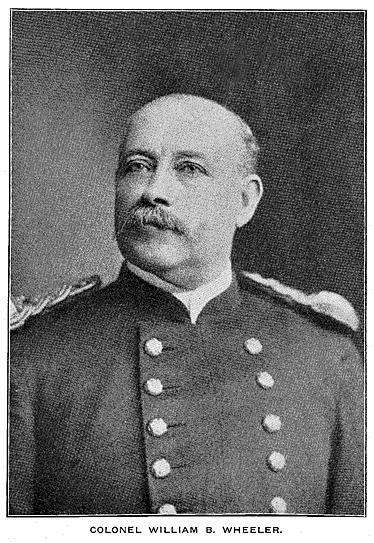 Left San Francisco, in command of Co. "E"
of the time as Major, until broken in health he was sent home on sick leave, November, 1899, a complete physical wreck. to his manhood and honor to his humanity and forbearance. from disease, he was on recruiting service in New York City. 1906, from the effects of his Philippine sickness which was the ultimate cause of his death. and William Darrow Wheeler, and a stepson, Harry Cornwall (Smith) Wheeler. officers as a sterling comrade and stout soldier, beloved by all who knew him. and was gentle, patient and brave to the end.